The idea is that you have a set of \(N\) cities, connected by various roads, each with their own distances. That is, we have a set of \(E\) roads, each with their own distance \(d_j, j=1 \dots E\). The question is, what is the shortest path that a salesperson can take to visit all \(N\) cities, traveling the shortest possible total distance and visiting each city once and only once? Like the N queens problem, the traveling salesperson problem is a good candidate for recursive backtracking. Also like the N queens problem, there are certain shortcuts we can take to trim down the possibilities we explore. Computer science pages on Wikipedia are generally pretty high in quality, and the traveling salesman problem page is no exception. It give a very thorough overview of the important aspects of the problem. Graphs are mathematical objects first utilized by Leonhard Euler to solve the Seven Bridges of Köningsberg problem. The concept is simple: you have a bunch of dots connected with lines. The dots are called nodes, and the lines are called edges. Graphs can be directed, meaning the edges are like arrows with particular directions, or undirected, meaning the edges simply represent a connection between the two nodes. We will skip over a vast amount of detail about graph theory that is both fascinating and useful, but M. E. J. Newman's paper "The structure and function of complex networks" (self-published and written as a course review) is an extremely detailed and academically rigorous overview of just about every important detail of the field. Naturally, the question of the total solution space arises. Assuming the graph of cities is perfectly connected (representing an upper limit on problem complexity), how does the number of solutions change as the number of nodes increases? We can start with a trivial graph, and count the number of possible paths through the entire graph, starting with a specific node. This is equivalent to counting permutations of a string that start with a specific character. For a string of length \(N\), the string has \((N-1)!\) possible permutations that start with a specific character. Therefore, as the number of nodes \(N\) increases, the number of possible solutions increases as \((N-1)!\), making the complexity class of the problem \(O(N!)\). Care is needed to prevent infinite loops in which the traveling salesperson goes back and forth between two cities. As we traverse the graph, we can mark each node as visited, to ensure we don't revisit nodes and go in circles. Boolean flag: have we visited this node already? Likewise, the graph edges can be represented using integers or doubles. Google Guava is a library of high-performance data containers in Java. The library provides some useful graph objects that we can use to easily solve the TSP on a graph. Install and use Guava by visiting the Guava project on Github, find the page for their latest release (here is version 21.0), and getting the latest .jar file. Graph objects in Guava are implemented using a set of objects: Graphs, ValueGraphs, and Networks. 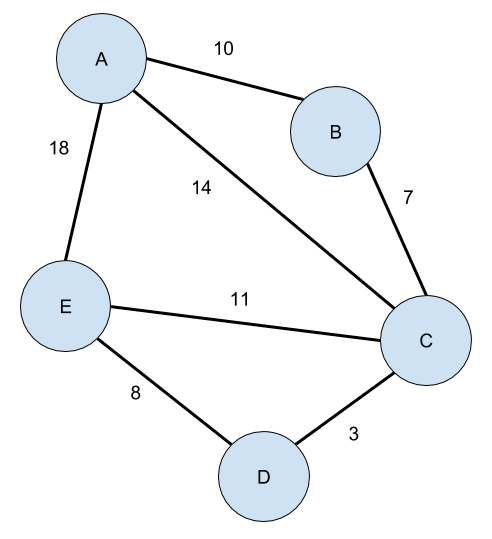 Graph objects treat edges as very simple and assumes they contain no information and simply link nodes. ValueGraphs associate a single non-unique value with each edge on the graph. This can also be used to solve the TSP. Network objects treat nodes and edges both as objects, and has the ability to deal with more complex edges: model multi-edges, repeated edges, directed edges, etc. We will use a Network object and design our own graph Node and Edge objects. Guava makes a distinction between mutable graphs, which can be modified, and immutable graphs, which cannot. Immutability provides some safety and assurances to programmers, and can make things faster. When we construct the network, we need a mutable graph to modify (add nodes and edges). But once the network is constructed, it is finished: we don't need to modify the network while we're solving the problem. Therefore, we construct a mutable network, assemble the graph for the given problem, and copy it into an immutable graph. We then use the immutable graph to access the graph while solving. see Google's Java style guide. Let's lay out the TSP class definition. This class is simple, and wraps a few pieces of data: the current route, the current distance, and the minimum distance. Note that we could also save the solution in a container, instead of printing it, by defining a static class to hold solutions, but we'll keep it simple. Now we can define the Node class to represent cities on the graph. Like a lined list node, we want to keep graph nodes simple. Note that Nodes don't need to store information about their neighbors. That's what we'll use Google Guava for! public String left, right; // For convenience in construction process. Not necessary. Note that left and right are used for convenience only during the graph construction process. Like the nodes, the edges don't need to know who their neighbors are, since that's what the Google Guava graph object will take care of. Construct a graph, with a given set of cities and distances. Initialize arrays and cumulative variables that will be used by the backtracking method. The actual graph construction process is put into another function called buildGraph(), so really the constructor just calls a function and then does #2. Now we actually use Guava's Immutable Network object, which takes two templated types, T1 and T2, which correspond to the node types and the edge types. We use a NetworkBuilder object to build the Network (an example of the factory template). This returns a MutableNetwork of Node and Edge objects, which we can then connect up using some built-in methods. Now here is the construction of the graph, using the Google Guava library. There are two loops here: one for cities, and one for edges. In the loop over each city,we create a new node and add it to the graph. To be able to easily retrieve the Nodes we have created, we also store references to the nodes in a map called all_nodes. When we construct edges, we use the map of all nodes all_nodes to get references to the Node objects that correspond to a label. That way, if an edge connects "A" with "B" at a distance of 24, we can turn "A" and "B" into references to the Node objects A and B. The structure of some recursive backtracking problems is to create a public and a private interface, with the public interface taking no parameters or a single parameter that the user will know, and the private method taking a parameter specific to the implementation. That's the pattern we use here. The solve method sets up the problem by picking a starting node (in this case, an arbitrary starting node). It then gets a reference to that node on the graph, and calls the recursive explore() method, which begins the recursive backtracking method. * Set up the graph, choose a starting node, then call the recursive backtracking method and pass it the starting node. And now, on to the recursive backtracking method. The method takes as a parameter which node we are currently on and the number of cities we have visited. As multiple explore methods choose different paths, they pass references to different node objects in the graph, and they pass different values of nchoices. The methods, when they do not encounter a solution, will choose a next node and call the explore method on it. Each instance of the explore method marks nodes as visited or unvisited on the same shared graph object. This allows instances of the function to share information about their choices with other instances of the function. Base case: - We've visited as many cities as are on the graph. - Check if this is a new solution (distance less than the current minimum). Recursive case: - Make a choice (mark node as visited, add city to route). - Explore the consequences (recursive call). - Unmake the choice (mark node as unvisited, remove city from route). - Move on to next choice. * Solution strategy: recursive backtracking. Last but not least, add the method that actually calls the TSP object's solve method, and define what to do when we encounter a new solution. This program just prints out new solutions as they are found, but you could also add them to a map (map routes to distances), or quietly keep track of the shortest path and not print it until the end. Additionally, we may want to perform a certain action when we find a new minimum distance. Note that this method may be called multiple times during the solution procedure. The answers given were satisfactory and correct, so we moved on to a more advanced graph construction process that utilized a static class to generate random, fully-connected graphs. This also implemented additional functionality to export to Dot format. This static RandomGraph class will be covered in later post. Note that these random graphs are fully connected - every node connects to every other node. Among the many interesting aspects of the problem, one of them is the impact of connectivity on the solution time. Another aspect of the problem is the topology of the network, and exploring how a larger number of unconnected nodes, or groups of nodes clustered together but isolated from one another, affect the final solution time and the final route. But before get to that, we have some other things to work out. This post described a working implementation of a recursive backtracking solution to the traveling salesperson problem on a graph. This is a naive solution, however, and in the next few posts about the traveling salesperson problem we'll focus on using timing and profiling tools for Java to profile this Guava program, identify bottlenecks, and speed it up. In fact, there is one small tweak we can make to the algorithm covered above that will improve the performance by orders of magnitude. But more on that in a future post.